This section displays the pictures of minibeasts, the small or tiny creatures, seen in Singapore. As this small urban nation has relatively few forested areas, large wild animals that still roam around in the wild are rare, consisting of mainly monkeys, wild boars and reptiles. Fortunately, we still have quite a good range of tiny creatures in the wild, something that I discover when I started to organize the pictures of these creatures in this website. Taking pictures of moving creatures is already a challenge, identifying them is even more difficult due to my limited knowledge on this subject and the lack of good pictorial references in majority of the groups except for the butterflies. The relatively small size of the minibeasts has truly stretched the limit of the macro function of my humble compact camera. So, the identification done in my pictorial collection is based on whatever information that I can get my hands on and my own deduction. Please write to me if you would like me to correct any information. More sets of these small creatures will be added gradually, as and when the sets are ready, and will be based on my way of grouping them. Enjoy! There is no doubt that butterflies are beautiful creatures, although their caterpillar may not always be that adorable to some folks for various reasons. Locally, butterfly is one of the most well documented group of insect. But, its close relative, the moth, gets relatively little attention. Even with a compact camera, I have managed to accumulate a handful of decent butterfly pictures over the years although it took me quite a lot of luck to do so. The availability of good reference websites has been very helpful with their identification. First of all, spiders are not insects. They have 8 legs instead of 6 seen in insects. Unlike insects, spiders do not have antennae on the head region. Not all spiders build web to trap their prey for food. Some move around hunting for their food. Spiders are considered scary creatures to most people especially after watching too much exaggerated documentaries and hearing lots of negative news about them. It is not surprising that they do not have many followers, unlike the butterflies although in general, majority of them are quite small and do not pose a threat to human being especially those found in Singapore. This group of insects is known as the true bugs because they have tube-like mouthparts for piercing and sucking fluid materials for food. Most members in the group feed on plant fluids like sap but some such as the assassin bugs do feast on other small creatures. As the bugs are a relatively diverse group of insects, I have arranged their pictures into 2 sections. One section called bugs while the other section called hoppers. There are few, if any, good pictorial reference for bugs in Singapore. This group of hoppers is from the suborder Auchenorrhyncha. All members of this group feed on plant and many of them are considered pest of plants as they are the carriers of plant diseases. This suborder is further divided into 4 superfamilies, namely Cercopoidea (spittlebugs or froghoppers), Cicadoidea (cicadas), Membracoidea (leafhoppers and treehoppers) and Fulgoroidea (planthoppers). 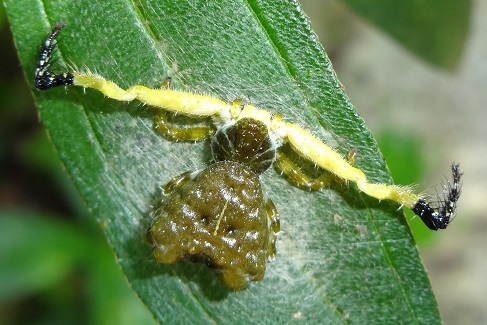 This is a group of poorly studied insects in Singapore. Interestingly, there is a genus of leafhopper (Singapora) that is named after Singapore as the type species Singapora nigropunctata was reported from here in 1967. This species of leafhopper looks very similar to Kolla bataviae. 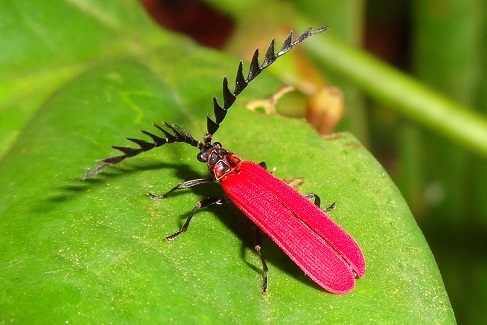 Beetles have the largest number of species among the insect groups. Except for some common beetles such as long-horn beetles, tortoise beetles and ladybird beetles, in many instances I cannot even figure out the type of beetle and which sub-group should I place them in. There are very tiny beetles that I cannot even get a decent clear picture with my compact camera. Since it is difficult to organize them based on their family with my limited knowledge, I have decided to group them by their common names. Except for sawfly, which I am still trying to figure out, most of us are familiar with the other members of this group such as bees, wasps and ants. Contrary to common perception, bees and warps are quite harmless as long as you do not attempt to touch or disturb them. As for ants, there are a few that can deliver nasty bites such as the Weaver Ant and Asian Army Ant. Fortunately, we do have someone (John Lee) who chases after wasps in Singapore and presents his findings with pictures. This helps with the identification of this group of fearsome-looking flying insects. The more visible members in this group are the grasshoppers, which are abundant in most vegetation especially the bushy type. Cricket and katydid are harder to spot since both of them are good at blending themselves into the surrounding vegetation. The most common cricket in Singapore is Nisitrus vittatus. As for grasshoppers, the most commonly seen species is Xenocatantops humilis. For expert in this area, we have Ming Kai who have published many related articles that serve as good references for my venture into this group of insect. Most of us will be very familiar with the large, sometimes scary cockroaches that are living with us in the urban environment, typically foraging among the rubbish or dark corners. 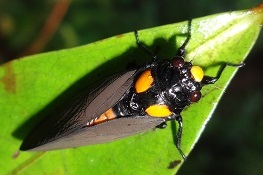 This dark brown winged creature is commonly known as the American Cockroach (Periplaneta americana), though it did not originated from America but Africa. Besides this obvious cockroach that roam among us, there are many others of smaller sizes and living in a different habitat such as the forested areas. One good example is the Dried Leaf Cockroach (Pseudophoraspis nebulosa), which is quite common the forest and about the same size as the American cockroach. While all of the above minibeasts has an "Order" classification, the snail and slug group appeared to have defy this convention. As I read, a group of experts revamp the classification of this group in 2005 by replacing the "Order" with "Clade". According to them, Clade focuses on classifying this group of slimy animals by looking at the similarity in their genes. In Singapore, the Giant African Land Snail (Achatina fulica) is the most commonly land snail seen likely due to its size. It is should be the largest land snail that roam in the wild here. The start of a small aquarium in February in 2015 had added 4 freshwater snails to my gallery and allowed me to closely observe them in the fish tank.